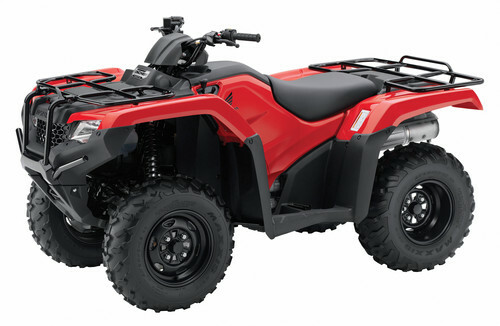 Honda’s ATV’s are available in two categories, Sport and Utility. Honda’s Sport ATV models are high performance, technologically advanced ATV’s and are perfect for exploring the backwoods trails or windswept wide open dunes. This segment has five models; TRX450R, TRX400EX, TRX300EX, TRX250EX and TRX90EX. Honda’s Utility ATV’s are great for tough jobs around the farm or for those hard to reach fishing spots. The FourTrax line of powerful and reliable utility ATV’s are available in several models, Rincon, Foreman, Rancher and Recon. 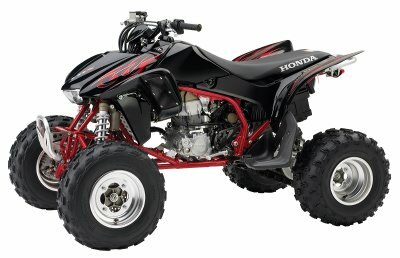 Honda ATV parts and Honda ATV accessories are widely available from most Honda ATV dealers. The FourTrax® Rancher® 4x4 ATV adds the extra capabilities of 4WD to its brawny liquid-cooled fuel-injected 420cc powerplant. This manual-shift model boasts an impressive list of features, including selectable 2WD/4WD TraxLok® with a torque-sensitive front differential. To add to the extensive list of ATV models available for the 2012 season, Honda announces another release for 2012, the much-praised FourTrax Foreman Rubicon ATV. The Honda FourTrax Foreman Rubicon ATV joins the comprehensive assortment of 2012 Honda street bikes and off-road machines that offer multiple choices to fill just about every niche in today's riding scene. This powerful and rugged 4x4 Honda FourTrax Forman ATV mates a reliable manual-shift gearbox to a time-tested air-cooled 475cc OHV engine--it's Honda quality at its best. And you have the choice of standard steering or the ease of Electric Power Steering (EPS). Honda's TRX450R- available in manual- and electric-start versions- has won in virtually every ATV racing discipline, adding two-time Baja 1000 winner to its mantel last year.